We can deliver a super anti-slip solution that reduces the risk of accidents on the stairs. 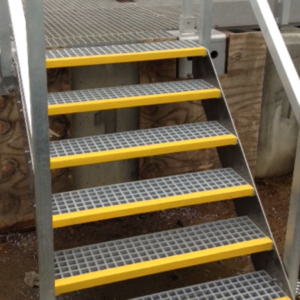 We actually produce non-slip steps in fibreglass and steel. Unfortunately, too many accidents happen on stairs. Especially outdoor stairs are exposed and potentially dangerous, because just a few drops of water are enough for steps to become slippery. In winter, there is even the risk that the steps will be covered with ice, and that is obviously dangerous. We can deliver a super anti-slip solution that reduces the risk of accidents on the stairs. We actually produce non-slip steps in fibreglass. Fibreglass steps are 100% maintenance free. Fibreglass stair treads are as strong as steel grates and can be replaced 1:1 (same height). Fibreglass steps weigh about a third of steel steps. Fibreglass steps are ergonomic to go and stand on as they are flexible. Fibre grating can be cut on site without finishing of any kind. The steps are available with our well-known anti-slip surface. They can be equipped with yellow anti-slip stair 'nose' embedded in the step. Which steps should be secured? If there is the slightest risk of an accident on a staircase, we recommend that the steps on the staircase be secured. It is clear, however, that there are stairs that are more dangerous than others. Stairs that come into contact with either oil, water, ice, grease or chemicals should always be anti-slip secured. Our anti-slip products are resilient and powerful and therefore suitable for indoor and outdoor stairs. We are a very flexible manufacturer, so we can easily produce non-slip stair treads in many different sizes. If you have special requests for production, we are confident that we can meet them. We have many years of experience in producing glassfibre stair treads for many different customers, and we have not yet gotten a task we could not solve. We are experts in safety optimization. We have many years of experience delivering safety optimization solutions to a myriad of different customers, and those years of experience have given us tremendous knowledge in our field. We therefore know almost everything that is worth knowing about anti-slip stairs, and we are more than happy to share our knowledge with you. If you need good advice or guidance on how to best make your staircase safe, contact us at +45 26 11 44 66. If you have questions that are not so urgent, you are very welcome to send us an email at realsap@realsap.com.